Visiting our ministries in Indonesia | Walk with us! Fr. Madya, SCJ, (provincial superior) and his driver picked me up just a little after 8:00 am from St. Paulus Minor Seminary and so began our 10-hour drive to Metro. We probably could have done the trip in nine hours but we made two stops along the way. Our first stop was for lunch at a Halal restaurant. Think of kosher and you’ll know that what it is to Jews Halal is to Moslems. Fr. Madya said in the past we would have stopped at our parish for lunch but it was turned over to the diocese and we no longer staff it. 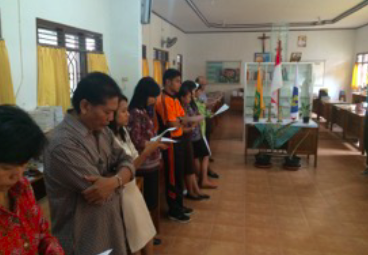 Actually that’s a common theme in the Diocese of Lampung. The SCJs have been here for 90 years and staffed all or almost all of the parishes but as the diocesan clergy grew, especially in the last 25 years, slowly the parishes have been turned over to the local church. Metro, for example, was one of our large parishes that we no longer staff. 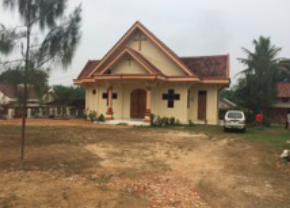 Our second stop was at St. Andreas (Andrew) parish in Mesuj, Lampung; the church and rectory (pastoran) were built in the last couple of years. It’s currently staffed by two priests, Frs. 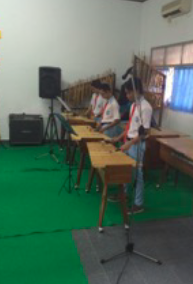 Sepiono, SCJ, and Eko Yuniarto, SCJ, and Br. Satria Pamungkas, SCJ, one of the 10 scholastics (regents) on his pastoral year assignment. We missed Br. Satria as the 10 regents are meeting in Jambi for their week of reflection just as the “baby priests” (The Indonesian term for those ordained five years or less) are meeting in Lampung. Actually that’s the reason Fr. Madya, made the trip as he will close the baby priests meeting on Thursday. Our long journey came to an end at about 5:30 p.m. as we pulled into the drive of one of the two houses for boarding students (boys) that we have not far from the school the SCJs operate. I am staying with Fr. Kusmartono, SCJ, and Br. Sukarman, SCJ, who supervises the senior high boarding students. Br. Antonius Sudaryono, SCJ, and Fr. Anggota Budiyo, SCJ, staff the house for the middle school boarding students. The two houses are about a half a kilometer apart from one another and within walking distance of the Yos Sudarso school. Our day began early this morning with Mass for the boarding students at 5:30 a.m. followed by breakfast, and then Fr. Kus took me to school to meet the faculty and tour the campus. We spent several hours together and then I was handed over to the care of Br. Antonius for the rest of the morning. It gave me a chance to use my rusty Italian as Antonius was in Rome to take care of the grounds while I was serving on the General Council. His own background was in carpentry. He returned to Indonesia after his stint in Rome and then worked in the Papua mission where, which by the way, both Fr. Vincent Suparman, SCJ, and Fr. Christianus Hendrik, SCJ, who nw work in South Dakota, also served. Papua is not an easy mission and one of the problems all the SCJs face is malaria as almost all of them come down with it sooner or later. Br. Antonius told me he managed the first two years free of malaria before the bug hit him. After four years in Papua he returned to Rome for several years to take the place of Br. Vincentius Dalijan, SCJ, another Indonesian brother skilled in the building trade, who went with Claudio della Zuanna, SCJ, when he was named archbishop of Beira, Mozambique, in 2012. The archbishop’s residence was in need of major repairs. After two years of getting the archbishop’ residence in shape Br. Vincentius returned to Rome late this past summer and Br. Antonio returned to Indonesia to take up his duties here in Metro about a month ago. Now that’s all a long way of saying his Italian was better than mine as Br. Antonius has been using it for the last two years. I must say though we managed to communicate well enough to the point the he was my translator into Bahasa Indonesia when we stopped by to visit two communities of sisters towards the end of our hour-long walk we took as part of our morning together.